New Year's Resolutions and Goals! Happy New Year everyone! Gosh what a month it's been. Since last time I posted, I've been really busy and away! Christmas happened, then we went down the coast, then New Year happened, then we went on an 11 day trip to Adelaide! I'll write a whole new post for that. New Year's Resolutions. I've made 7! Here they are. 1. Floss my teeth DAILY! 2. Write in my diary daily. I don't mean writing long entries about my feelings and opinions, but I do like to write down what I did each day before I go to sleep. That way, I can look back and remember each day and they don't blur together. I find it really helpful to write things down so I can find out when things happened later. I've found that we tend to stay up too late and then sleep in, especially on weekends or when I have to go in to work later. This really knocks me around when I have to get up at 6:30 for percussion ensemble on Monday morning! So I would like to train my body to generally get up and sleep earlier. I'm going to schedule my teaching for mornings when I can this term. Charles also finds that when he goes in to uni earlier he gets more work done and can come home sooner. Sounds obvious but it's taken us this long to figure out! 4. Buy less and have less. I feel like I've already started this resolution. I am just tired of having so much stuff - and in particular, having so many clothes. Yesterday I went through my clothes and gave away 28 items, and it felt so cleansing. I still have hundreds of items left, but it's a start! Going through, I found lots of clothes I'd just forgotten about. Also, having a small house and a few big things we need to have (our instruments), space is in short supply. 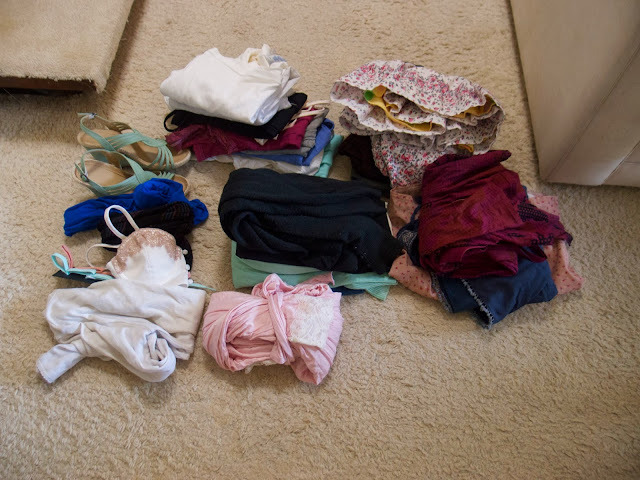 This is all the stuff I got rid of: 9 tops, 5 cardigans, 4 skirts, 3 dresses, 1 pair shoes, 1 bra, 2 tights, 1 spencer, 1 dressing gown. 5. Use up a bunch of my stash. I have a lot of fabric. Most of it was bought with a purpose in mind, but also a lot was gifted to me or an impulse purchase. I want to try to get it down to a reasonable size! This also applies to my yarn stash! 6. Sew more wearable clothes for me. I know this is against my previous resolution of having less stuff, but I can't live with the same clothes forever. They wear out and get old! So instead of buying I want to make myself wearable clothes. This means not making another party dress, but instead making a plain blouse to go with my skirts. Not making an experimental jacket out of blue tartan, but instead making a basic fit-and-flare dress to go with my cardigans. Make more underpants! In this way I hope to have a better thought out wardrobe that is easy to mix and match. You need to put more thought into making a garment than buying one, so this mindfulness will help with my other resolutions. 7. Finish projects before starting new ones. Sometimes this can't be helped, like when it's Christmas coming up and SOMEONE asked for a Dr Who scarf. Projects can still be put on hold for things like this. 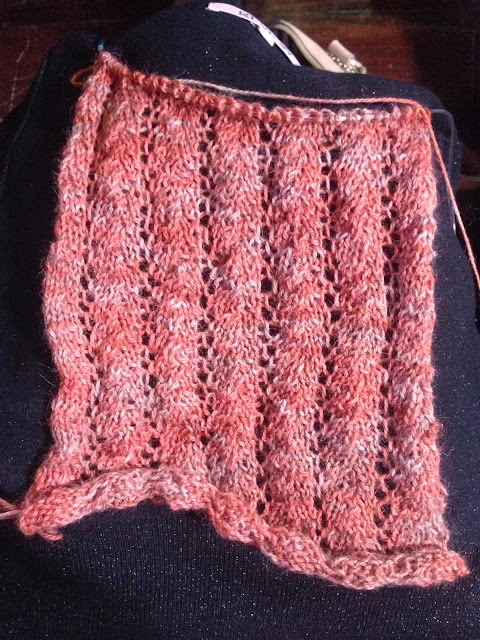 But currently, I have 4 knitting projects on the go, and 4 with wool bought queued, and a bunch of sewing projects ready to start. On top of my crochet and needle felt and everything. This is too much and it makes me stressed! So until my current projects are down to a reasonable level, I am NOT ALLOWED to start anything new. I need to stop getting bored with my projects! Plus, the feeling of finishing something lovely is so worth the wait. I'd like more of that and less frustration with myself! Next, some of my goals for 2014. 1. Start up my custom underpants business! 2. Save up a bunch of money for the future! 3. Design and make some of my own patterns! 4. Become a better teacher! Some of your New Years resolutions are remarkably similar to mine! Like making clothes I'll actually wear (and that don't look handmade), using up my stash and going to bed earlier. Trying to organise my time better is a big one for me as I don't generally have a lot of free time and I seem to waste so much of that instead of being productive! I heard Adelaide was really great, I kind of regret not going, but I really couldn't have. I have a couple of big concerts this year (one on Tuesday) that I needed to practice and rehearse for. I'm working full time in the library for two weeks from today so that rules out a lot of practice time. Can't do everything! You are actually the busiest person I know! If you're at the library full time I might pop by tomorrow morning or Monday and bring my culottes pattern? I wore them all the time in Adelaide and Niki wants a pair too! I love being able to walk in the wind without any flashing! I can totally relate to so many of these goals. I'm in the process of doing a huge clear-out of all my things. In particular my wardrobe, my linen cupboard and my kitchen utensils. I feel as though my poor little flat is just bursting at the seams, and there are so many things I've been hanging onto that I'm ready to jettison. I'm also taking a good look at my craft stash. 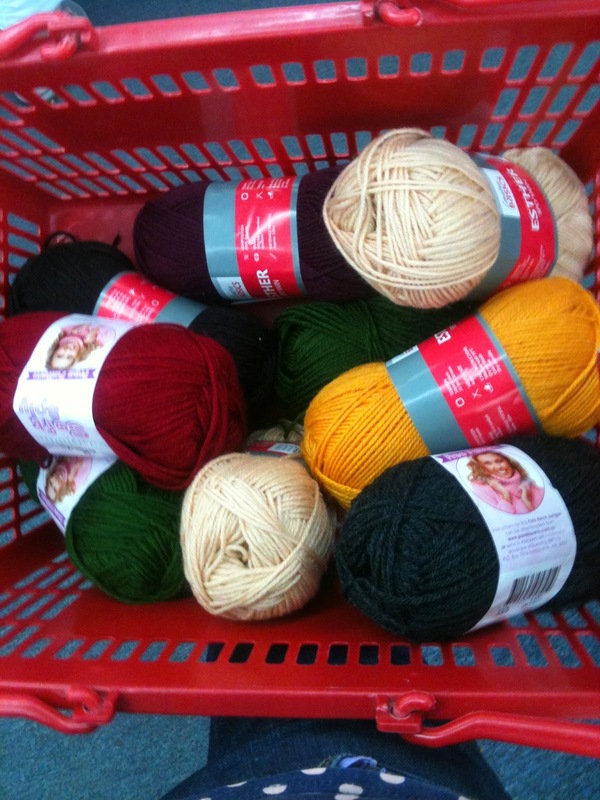 I want to use up some of my yarn before I buy any more. I don't think I'll ever be able to work on just one project at a time though. I'm too much of a scatter-brain for that! Good luck with your goals. It really looks like you're on the right track. It helps to think of yarn or fabric as time. Do you have time to knit this yarn you're thinking of buying? This helps me not buy all the things!